74-year-old Father Bill Graney was assaulted around 2 p.m. Monday inside Resurrection Parish in the unit block of Videre Drive. A man is behind bars after police say he brutally attacked a priest inside a Wilmington church. Twenty-five-year old Joshua August has been charged with felony Assault 1st, misdemeanor Assault 3rd, misdemeanor Resisting Arrest, and misdemeanor Criminal Mischief. Church employees tell police August could be heard arguing with Father Graney inside of an office. A staffer says they heard August become angry about "weed that he wanted back." After the argument, they heard what sounded like a struggle, and when they came in they saw the priest lying on the floor. While Father Graney was on the floor, they say August was punching and kicking him in the stomach and the face numerous times. The church employees attempted to break up the fight, but police say August pushed them aside and went into another room, grabbed a bottle of wine, returned and poured it all over the injured priest. 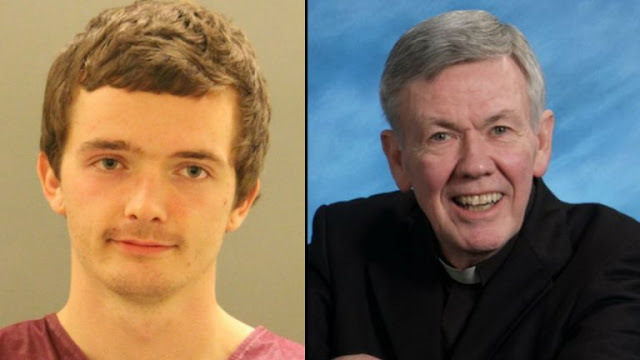 According to the witnesses, August then struck Graney in the head with the bottle; he then allegedly grabbed a can of compressed air and sprayed it into the priest's mouth. Police say the church employees were able to lure August out of the church by telling him that they would give him a ride and money. Once he was outside, they then locked the front door locking him outside. Police say August then struck the door multiple times trying to get back in. He did break the main doors of the church, however, he was not able to get into the locked church office. After skateboarding away, New Castle County police eventually arrested. At August's family home on Tuesday his grandfather told us Joshua has long suffered from mental illness, but declined to elaborate. "Father Bill is very giving, he's very loving. He would help anyone that came to him and asked for help. I don't think he would ever turn anybody down," says church member Pamela Skwish.